The question studied within the framework of the Wilhelminaoord Workshop was: In which way the mould material does influence the cast structure of a bronze object? For this, casts in two different mould materials (clay and soapstone) were carried out. The 10% tin bronze was cast at about 1100°C into slightly preheated moulds. The casts were performed in order to come as close as possible to Late Bronze Age circumstances. The experiments carried out in Wilhelminaoord were thought to be preliminary tests for several experimental series over a longer period of time. 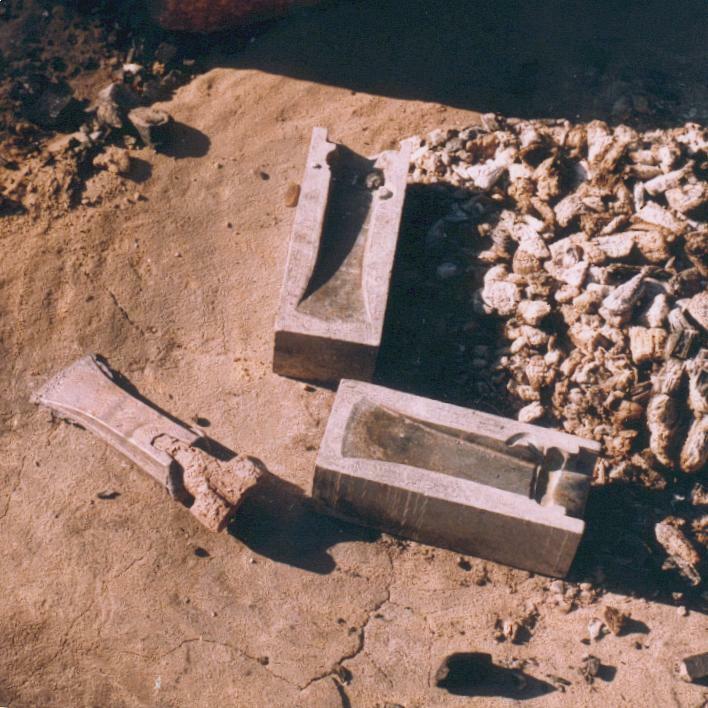 A full and detailed experimental report on the investigation concerning the analysis of the cast structure of experimental as well as archaeological objects and thereby the identification of the mould material used is forthcoming. The experiments carried out in Wilhelminaoord were preliminary tests for several experimental series over a longer period of time. Our experiment deals with a question concerning the material of which a prehistoric mould for a bronze object was made. We posed the following question: can we learn about this material through the microstructure of the bronze object itself? We think it is important to know the effects of the cooling rates of different mould materials on the microstructure of the cast bronze objects. Research in this direction has been done by Staniaszek and Northover (1983), Ottaway and Seibel (1998) and Steffgen and Wirth (1999). However, they only focused on single aspects of this problem. The main question Staniaszek and Northover (1983) were interested in, was the influence of lead on the casting conditions and its effects on the bronze object. Furthermore, they used three different mould materials (stone, clay and metal) in their experiments. The dominant factor controlling the properties of the alloys turned out not to be the amount of lead in the alloy but the mould itself, i.e. material, preheating, cooling rate, mass. These latter points have then been pursued by Ottaway and Seibel (1998) for sand moulds. Further research has been done by Steffgen/Wirth (1999) by comparing the casting effects of a bronze mould with that of other mould materials (clay and sandstone). These ‘casts’ were mainly carried out by computer simulation. It is noteworthy that previous casting experiment on that question were carried out in the laboratory or were computer simulated. One must consider if and to what extent the trace patterns are comparable with those from original archaeological finds. However, although previous research has shown that the mould material and the quality of the cast bronze object are related, a complete 1:1 comparison of the microstructure between all possible mould materials for the Late Bronze Age (i.e. bronze, sandstone, soapstone, clay and sand) is still missing. Establishing a series of casts executed in different mould materials is exactly what we would like to do in this project. ExperimentA have been working with a furnace construction based on research results and many years of experience of Walter Fasnacht (Fasnacht 1995). 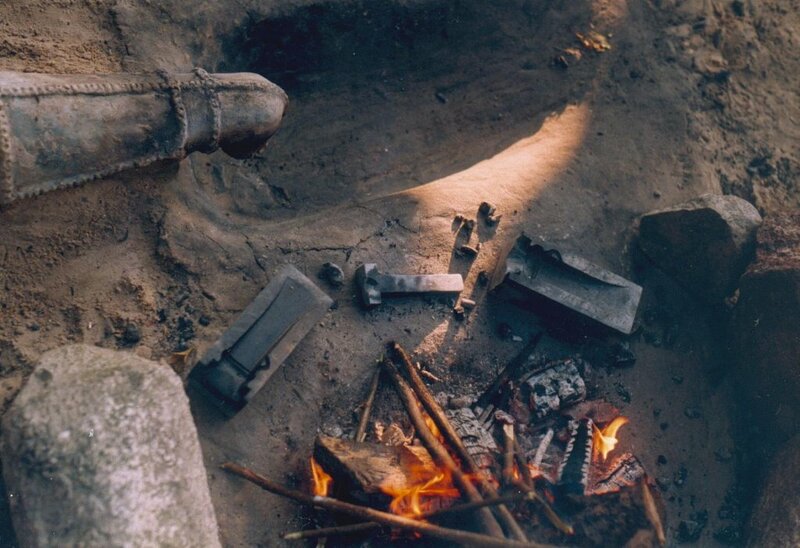 The furnaces and tools we use for casting experiments are based on archaeological finds. The furnace, i.e. a pit coated with loam, after a feature from Säckingen (D) (Gersbach 1968); a clay tuyère as found in Mörigen (CH) (Bernatzky-Goetze 1987); a hollow 'Y'-shaped branching tube connecting the tuyère to the bellows, after a find from Hjortspring (DK) (Rosenberg 1937); two leather bellows designed according to ethnographic evidence and depictions on Greek red-figured vases (Zimmer 1990); and several open crucibles based on examples known from Cortaillod (CH) (Wyss 1971). 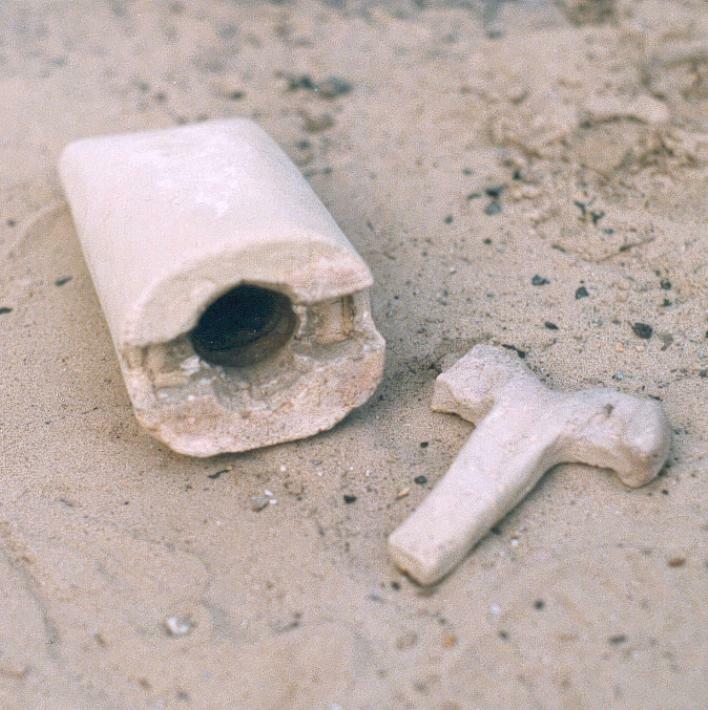 A more detailed explanation of the archaeological basis for the reconstruction of the casting system is given in Fasnacht 1996. A bronze socketed axe mould from Thiais (Val-de-Marne, France) served as a model for the moulds. For producing the same conditions for each cast object, we used this same socketed axe form for the different mould materials (bronze, sandstone, soapstone, clay and sand). The castings were carried out during four days. 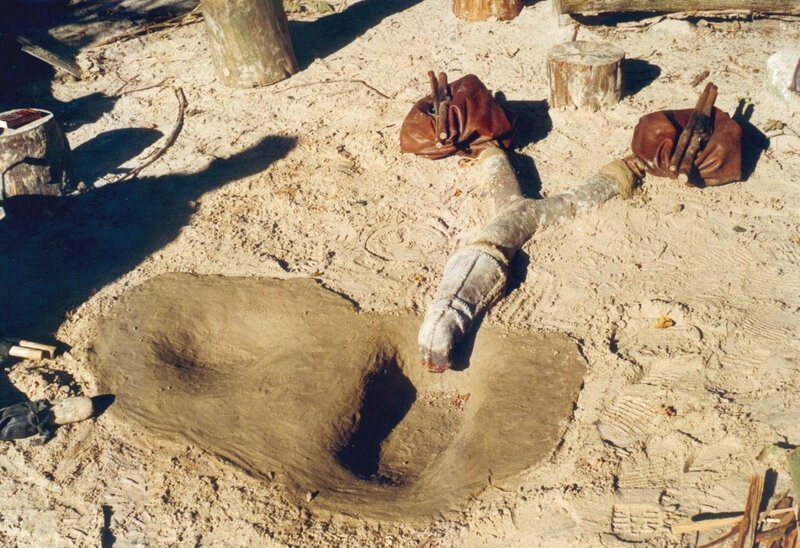 After constructing the furnace (See Figure 1), the first day was used for drying it and making some preliminary casts to try out the whole process. In total, we made 17 casts in soapstone and clay moulds in four half-days. The rest of the time was used to produce new moulds. For the casts copper was melted first in a crucible in the charcoal heated furnace described above. Tin – with a ratio of 1 to 9 – was not added until about five minutes before the cast. The heating process took average of 20 to 25 minutes. By then the bronze was fully melted and ready to be cast. The moulds were heated in a separate charcoal fire to the necessary temperatures. A new soapstone mould has to be treated carefully in order to obtain good casting results. Therefore, preceding the first cast, our mould was oiled with normal sunflower seed oil and dried near the furnace (See Figure 2). Then it was slowly heated up. Afterwards it was covered with charcoal and left to cool down during the night. After having the mould treated like this, it produced good results in the first cast. The main problem with the soapstone as well as with the clay moulds tended to be the precise positioning of the clay core for the socket (See Figure 3 and 4). On the fourth day our main activities concentrated on the educational part with demonstrations and explanations. The educational participants made their first attempts at pumping the bellows and casting. The experiments carried out in Wilhelminaoord were preliminary tests for several experimental series over a longer period of time. The tests have shown that for further investigation we have to set up previously fixed preheating temperatures for the mould as well as for the bronze before casting. The measurements of the cooling rates of the cast bronze and the mould have to be made and recorded by exact instruments. This will allow us to produce mutually comparable samples. As a direct result of the 'test-casts' in Willelminaoord, we realised that we would have to modify our project. We decided to do further research into the "ideal heat up temperature" for the different mould materials and the cooling behaviour of the cast objects. Then finally we hope to answer the question: in which way does the analysis of the cast structure of a bronze object allow us to identify the mould material used? Therefore temperature measurements and large data series will be necessary. For that reason, we will have to modify the form of the object to a more 'practical' size such as Late Bronze Age bracelet from Hauterive-Champréveyres / Switzerland (Rychner-Faraggi 1993). The experimental series are planned to be carried out in 2000. In order to answer the question to which extent the material of the mould influences the microstructure of the cast object, the samples will be analysed at the laboratories. The analysis will be done in co-operation with the Institut für Metallforschung ETH (Eidgenössische Technische Hochschule) in Zürich. A full and detailed experimental data will be published 2001/2002 in the periodical of the Historical-Archaeological Experimental Centre at Lejre Studies in Technology and Culture in English. OTTAWAY, B. S., and S. SEIBEL, "Dust in the wind, experimental casting of bronze in sand moulds", Paléométallurgie des cuivres, Monographies Instrumentum, vol. 5, pp. 59-63, 1998. ROSENBERG, G., "The Hjortspring Find", Nordiske Fortidsminder, vol. 2/1, 1937. RYCHNER-FARAGGI, A. - M., "Métal et parure au bronze final", Hauterive-Champréveyres, vol. 9, Neuchâtel, 1993. "The properties of leaded bronze alloys", The Proceedings of the 22nd Symposium on Archaeometry, held at the University of Bradford U.K. 30.3.-3.4.1982, Bradford, pp. 262-272, 1983. STEFFGEN, U., and M. WIRTH, "Eine bronzene Gussform für Lappenbeile vom Bullenheimer Berg/Mainfranken. Archäologische und technische Untersuchungen zur endbronzezeitlichen Beilproduktion", Dedicatio, Hermann Dannheimer zum 70. Geburtstag, Kallmünz/Opf., pp. 35-56, 1999.
ZIMMER, G., Griechische Bronzegusswerkstätten, Zur Technologieentwicklung eines antiken Kunsthandwerkes, Mainz, 1990.